For those interested, tickets go on sale this Friday (5/12) at 10AM PST. For those interested, more details can be found on the DC4C announcement page here. All proceeds from this event will be going directly to the ACLU Nationwid & Planned Parenthoo organizations. We as Death Cab For Cutie are appalled by the divisive, xenophobic and misogynistic agenda the Trump Administration is attempting to implement in our country. 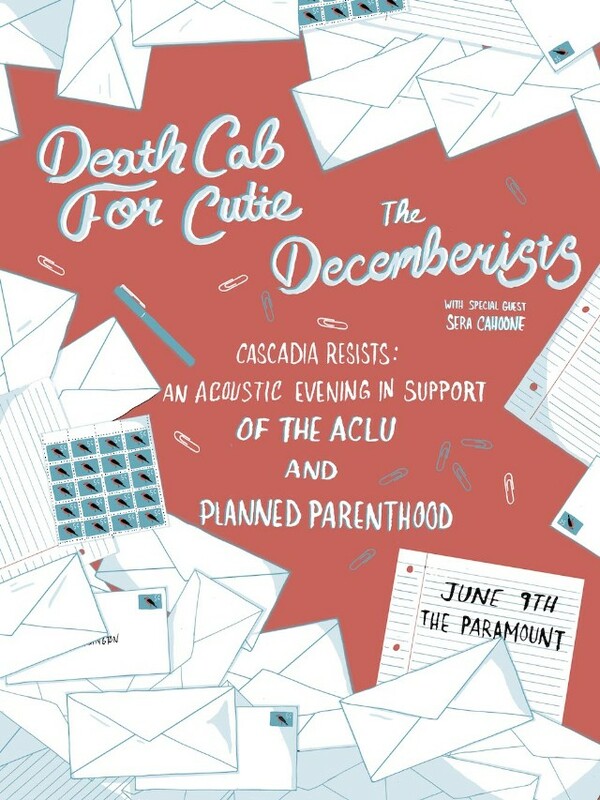 We are proud to be joining our friends The Decemberists and Sera Cahoone in support of both the ACLU and Planned Parenthood at this pivotal time in our nation’s history. There are enough stories from this last week alone — the Trump administration’s attempts to curtail first amendment protections and the GOP’s passage of the heartless AHCA — to remind us that organizations like Planned Parenthood and the ACLU need our support now more than ever. We Decemberists are proud to do our bit to help those orgs stay funded and active in their communities, both local and nationwide. RESIST!